Kent-based Motorbase Performance secured double Independents’ Title victories on home turf during an enthralling 2016 Dunlop MSA British Touring Car Championship season finale on the iconic Brands Hatch GP circuit this past weekend. Both the Independent Teams’ and Independent Drivers’ Titles will be heading back to Motorbase towers, with the Wrotham-based outfit commemorating its 11th year on the BTCC grid in perfect style – with Mat Jackson claiming the team’s seventh win of the season, his 30th in the series, in the nail-biting season climax. Jackson and Jordan were two of an unprecedented eight drivers in contention for the UK’s most coveted motorsport crown heading into the weekend, though they weren’t able to dice for the overall Drivers’ title to the last, the pair did the job. Jackson’s race three win saw the DUO-backed driver end the season in third spot – the highest-placed Independent driver – just 16 points off returning champion Gordon Shedden. In spite of a challenging weekend, Red Bull athlete Jordan managed to hold on the top spot; clinching the third career Independent Drivers’ trophy in his maiden season as part of the Motorbase line-up. In the Teams’ battle, Motorbase took a credible 3rd place overall behind the BMW and Honda manufacturer-backed outfits, ending the season just 34 points off eventual winners, Team JCT600 with GardX. 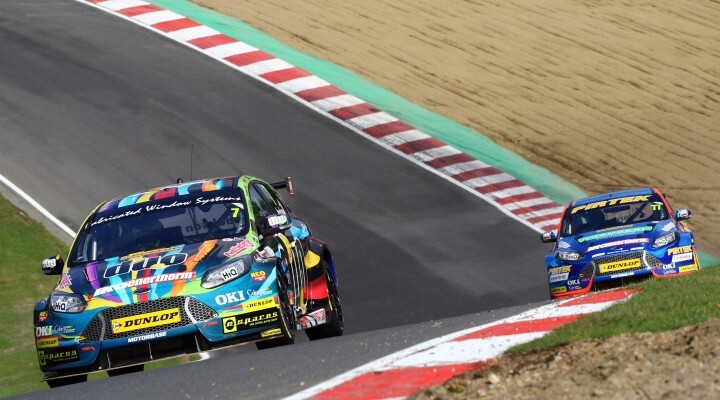 The weekend topped off Motorbase’s most successful BTCC campaign to date with its drivers amassing an impressive tally of seven outright race wins, seven outright podiums, 15 Independents’ race wins and 21 Independents’ podiums between them in the Mountune-powered Ford Focus STs. Jackson also jointly tops the table of most race wins this season with five. Delighted Team Boss Oly Collins said: “It was a great end to the season. It’s been such a great year for the whole team at Motorbase and now we can celebrate our two BTCC Championships. The aim this weekend was to win the outright Drivers’ and we came tantalisingly close but full credit to Gordon [Shedden] and the Honda team on their win. “We had issues in qualifying which put us on the back foot and unfortunately that set us up for a difficult weekend,” said Jackson. “The GP circuit is a hard place to overtake on so to get back to where we did is great result and a great effort from everyone in the team. “The car was phenomenal in the last race and it’s great to go out with a win and also to have taken our first Teams’ trophy at the end of an interesting season. We’ve made big steps forward this year having two cars scoring big which is what you need to win a title in the BTCC so it’s fantastic for that hard work to have paid off. “This is the third time that I’ve won the Independents Title so to do it again and help Motorbase to win their first ever BTCC title in my first year with the team is something that I’m really proud of,” said Jordan.